Fumiki, my second boy, 7 years and 6 months old, died of the terrible disease, leukemia. His ordeal began one day when suddenly he experienced pains in his joints. His gums became swollen. His face became distorted. My wife wondere if it was leukemia. An ominous premonition came across our minds. The shock of July 29, 1965, is unforgettable for me. It was on this day, when Hiroshima was sizzling with summer heat and the memorial day of August 6th was at hand, that we learned that our 4-year-old boy had leukemia. On graduation day he brought home a scrapbook of his kindergarten art work entitled “Ayumi,” which means “Walking” [used in the sense of following a course]. 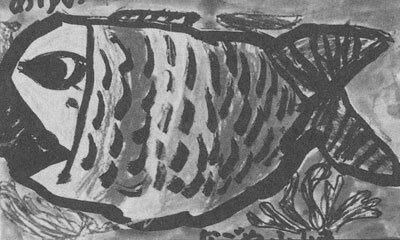 I found in it a picture of a big sea-bream with its mouth wide open, seeming to enjoy the delicious seaweed it was eating. A sea-bream in Japan means good luck. I put the picture on the wall, hoping that somehow it would bring him good luck. His grandmother bought him the biggest school bag available in order to celebrate his going to primary school. Since Fumiki was fat and tall for his age, the school bag looked very good on him, strapped on his back just like every other Japanese boy and girl preparing to enter first grade. I covered it with a piece of yellow cloth, as is our custom, so that he could be easily seen on the street and protected against traffic accidents. In spite of his parents’ strong wish and prayers, death finally took Fumiki away. He suffered from leukemia for two years and six months, which seemed to me both a short and at the same time a very long period for one small life to be consumed by a terrible disease. Fumiki’s only wish was to get better and to live. 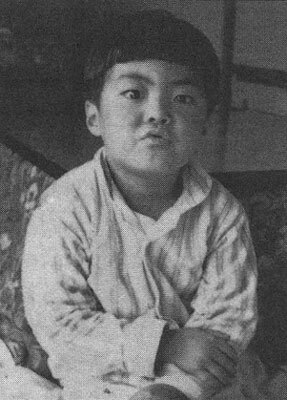 At 2:45 AM on February 22, 1968, Fumiki breathed his last breath. It was a snowy night in Hiroshima. Four years have passed since his death. Our grief has become deeper and deeper. Every time we hear about the death of a second-generation victim (child of an A-bomb victim), we recall our son’s death, and I never fail to visit his death bed. On their dead faces, again I see Fumiki’s face. I shall never forget him. I’m afraid that acute leukemia is always trying to attack not only victims themselves but even their children as well. Unless we bring about peace in the world, unless we prohibit the production of all atomic and hydrogen bombs, we shall eternally have to face and suffer many deaths like Fumiki’s.